This light, refreshing salad, which serves two as a main course or four as a starter, is perfect as an evening meal in the warmer months. Make it when the corn is at its sweetest. Lightly season prawns on both sides with salt, pepper and finely chopped fresh tarragon. Heat oil in a small frying pan and fry prawns for 2-3 minutes each side. Turn off the heat and leave to cool. Cook corn cobs in boiling water to cover for 7-10 minutes then drain and cool. With a very sharp knife, cut the kernels off the cobs, leaving some joined together. Mix sour cream with lemon juice. Add the cucumber, spring onions, most of the red onion, most of the herbs, most of the corn, chilli to taste and seasoning to taste. 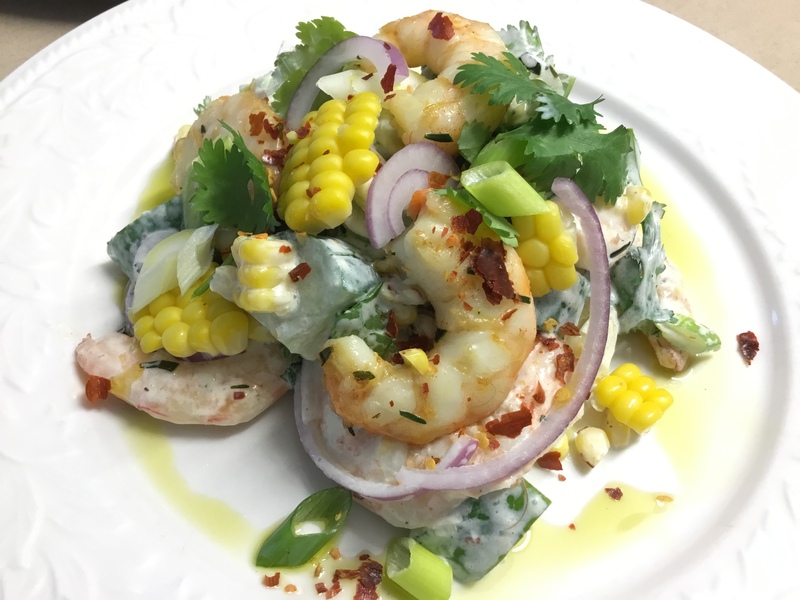 Arrange on serving plates, then arrange the prawns on top and garnish with the remaining red onion, corn kernels and herbs. Drizzle a little oil around each serving. We planted two grapevines at the farm, one red and one white. We didn’t pay a great deal of attention to the varieites and now discover that the black grape is what’s known as a Champagne Grape. This has nothing to do with Champagne – either the region or the beverage – it’s just the name. The fruit of the Champagne grape is small and round and looks more like a blueberry than a grape. 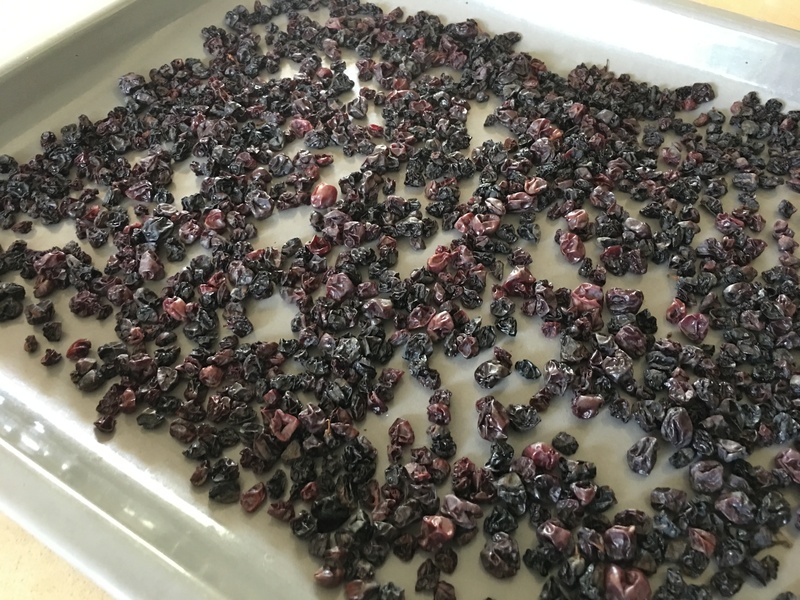 It’s the variety which is dried to make currants, which aren’t really currants at all. Traditionally used in Christmas cakes and puddings, currants are also known as Black Corinthian Raisins or Zante raisins. We’ve been eating these small sweet grapes fresh for dessert or breakfast, with a dollop of Greek yoghurt. I also dried a few as you can see in the photo. Left on a tray in a sunny spot they were ready in a few days. The last few Champagne grapes went into this recipe for scallops from a New Zealand website called Epicurious. Matthew declared it was Business Class food, which I think he meant as a compliment – something Neil Perry who plans the menus for QANTAS might approve of? Dry scallops thoroughly with paper towels then season with salt and pepper on both sides. Heat half the butter in a frying pan large enough to cook the scallops in one layer. Let the butter brown slightly then add the scallops and cook them for 2 minutes each side over moderately high heat, until nicely browned. Remove scallops to a warm plate and cover with foil. Turn the heat down a bit then add the remaining butter to the pan with the shallots. Cook, stirring for 2 minutes or until soft. Champagne grapes are the size of blueberries so if yours are bigger cut them in half. Add grapes to the pan with the lemon juice and most of the almonds and cook, stirring for about 2 minutes. 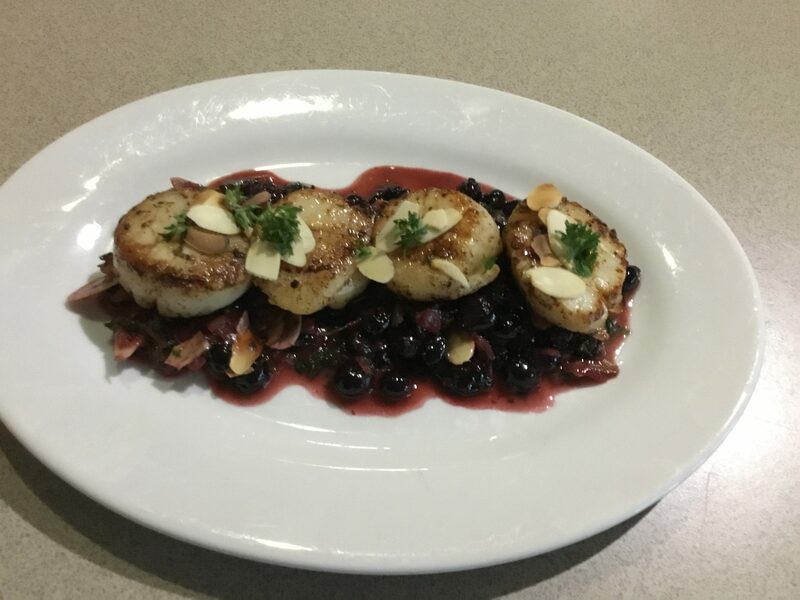 Add most of the parsley and any juices which have accumulated on the scallop plate, then divide among 2 plates (main course) or four plates (starter) and top with the scallops, the reserved nuts and parsley to garnish. Note: as a main course for 2 you will need 8-10 scallops and as a starter for 4 you will need 12. 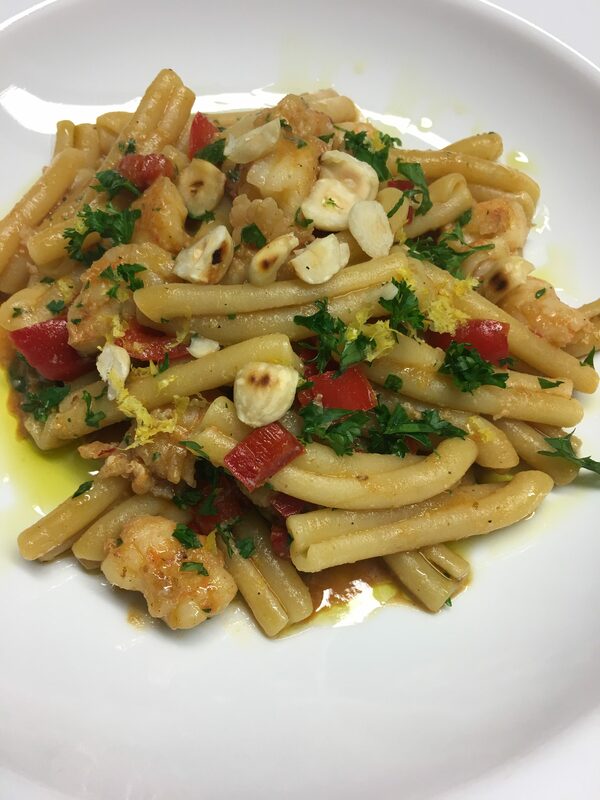 Substitutions: use the white part of spring onions (scallions) instead of shallots; use dried currants, (reconstituted in some hot water for 30 minutes, then drained) instead of the grapes; use pine nuts instead of almonds. 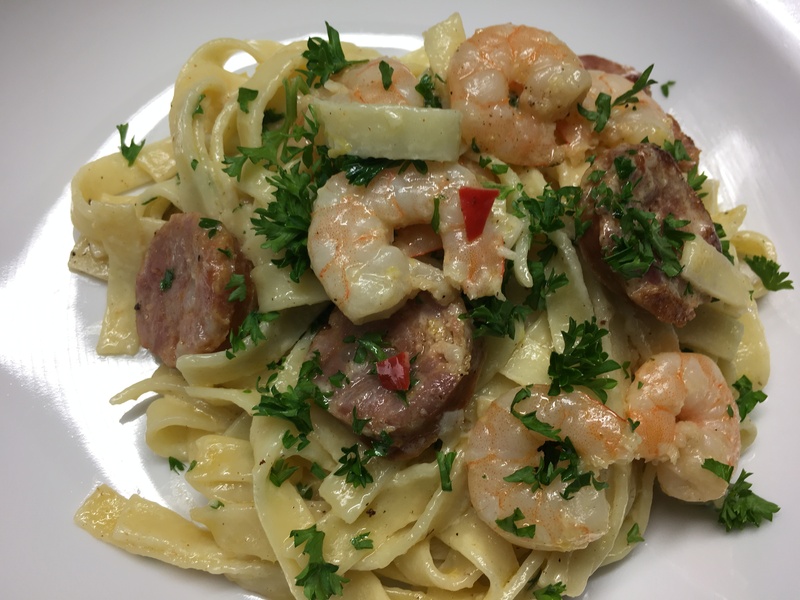 This quick prawn dish is delicious on its own or served with rice, pasta or crusty bread. I made half the recipe. In a large frying pan, melt butter and fry garlic and onion until soft but not brown. Add the prawns and cook, stirring, until they turn pink. Add the wine and cook for 2-3 minutes over high heat to reduce a bit. 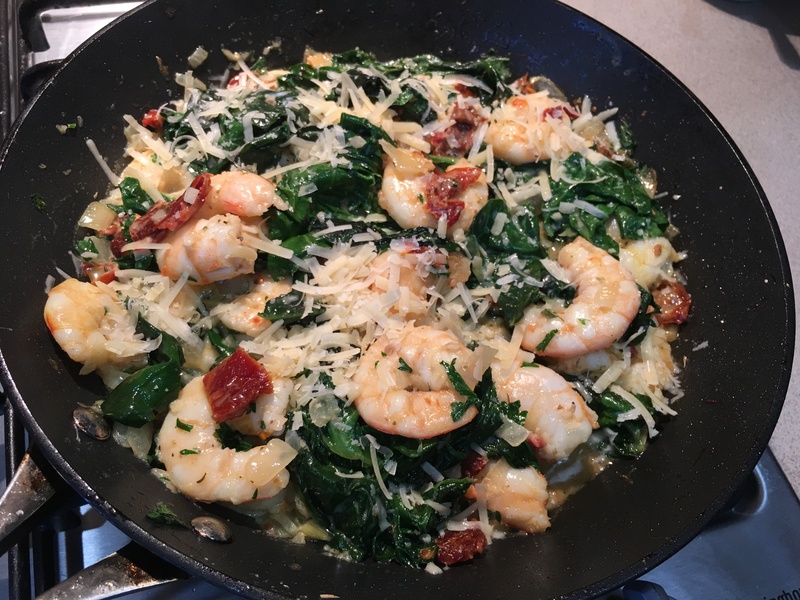 Add sun dried tomatoes, cut into thin strips, spinach, herbs and cream. Cook, stirring for 2-3 mins or until spinach has wilted and sauce has thickened a bit. Season to taste then serve topped with the grated cheese. Variation: use cubes of chicken breast instead of the prawns. These rice paper rolls make a refreshing aperitif or light dinner. There’s no cooking involved making them the perfect choice for a hot summer’s evening when everyone is feeling lazy, even the cook. The rolls can be made up to three hours ahead and kept in the fridge, covered with plastic wrap, so they don’t dry out. Vary the ingredients according to what you have on hand. Place vermicelli in a bowl and pour over boiling water to cover. Stand for 2-4 minutes or until tender, then drain well. Use scissors to roughly cut the vermicelli into shorter lengths then place them in a bowl with the prawns, mint, cucumber and spring onion. Season to taste. For the dipping sauce, pound garlic and sugar to a paste in a mortar and pestle then mix in the remaining ingredients. If preferred, instead of making the dipping sauce serve the rolls with store bought Thai Sweet Chilli Sauce. Fill a bowl with hot water. Working with one rice wrapper at a time, submerge in water to soften for about 20 seconds, then place on a damp tea towel. Spoon some of the prawn filling down the centre, fold in the ends, then roll up tightly to form a cylinder. Place on a tray lined with non-stick baking paper and cover with a damp tea towel. When you have made them all serve immediately or cover with plastic wrap and refrigerate until serving time, up to 3 hours. 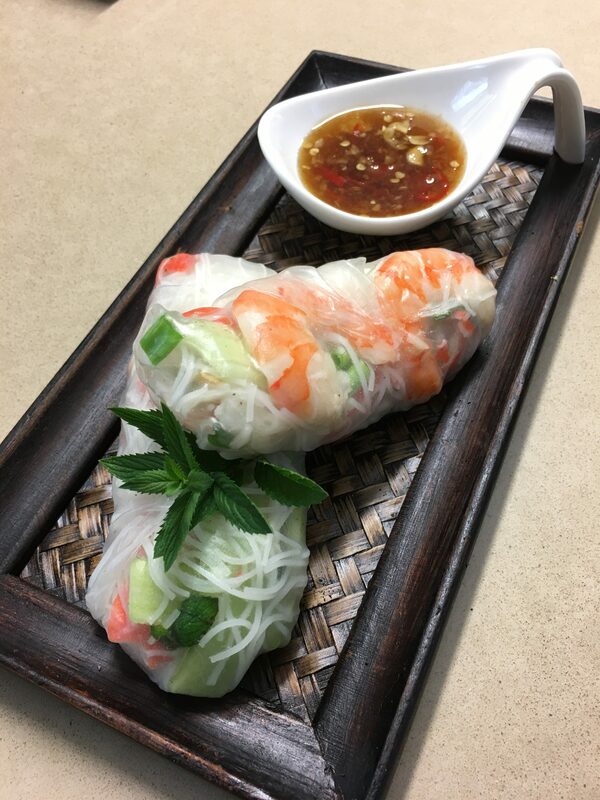 Serve 2 or 3 rolls per person, with the dipping sauce and mint. Note: rice paper wrappers are sold in most supermarkets and Asian grocery stores. This lovely summery salad was in a supermarket recipe hand out. I’ve made a few changes as I always do. 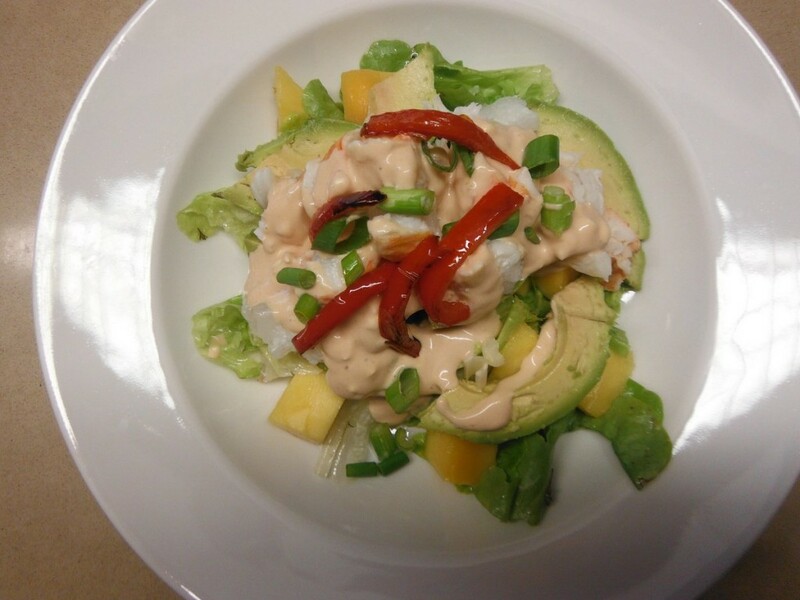 Perfect for the warmer weather when mangoes are in season. Place onion in a small bowl. Add salt, sugar, vinegar and water. Mix well then leave to macerate for half an hour or more. Drain and pat dry with paper towels. Place all ingredients for dressing in a jar with a lid and shake well. Arrange salad leaves in a large shallow bowl or four individual serving plates. Use small leaves or break larger ones into bite sized pieces. 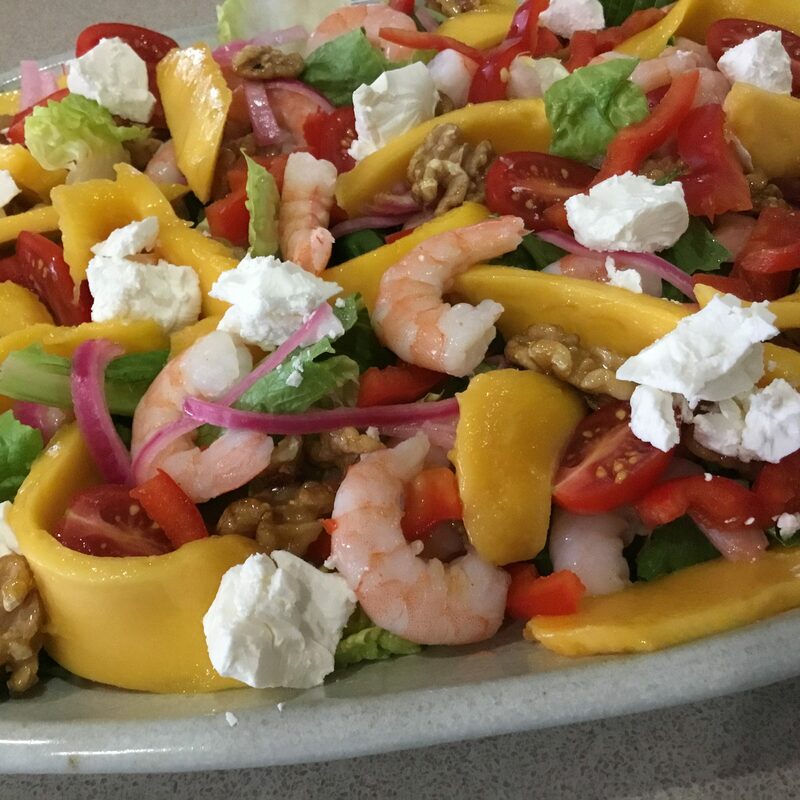 Top with the mango, capsicum, tomatoes, prawns, feta or goat’s cheese and the drained onions. Place walnuts in a dry frying pan and stir over moderate heat until lightly toasted. Add honey, stir to coat, then arrange over the salad. If you do this ahead and let them get cold they will stick to the pan, so you will need to turn the heat back on briefly to loosen them. Drizzle salad with some of the dressing. Variation: use peaches or nectarines instead of mangoes. Whenever I serve baby octopus I think of my dearly departed Dad. 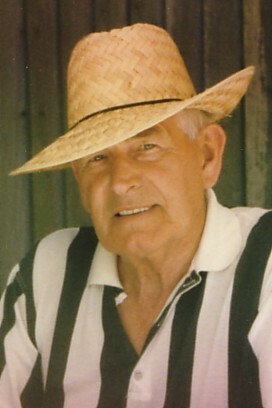 His name was Kenneth but in the family he was always known as Kenf. For someone brought up on a very traditional British diet Kenf was quite adventurous when it came to eating. He loved Chinese food and spicy curries. In fact he pretty much ate anything you put in front of him. My parents came over from the UK to visit us in Paris and I decided to serve baby octopus. As we finished our meal I glanced up and although he didn’t say anything I could tell that he wasn’t impressed. “What do you think?” I enquired. “Well if you really want to know” he replied “I thought it was like eating Dunlop rubber”. Maybe they were a bit chewy, but I didn’t think they were that bad! Since then I’ve found this recipe which isn’t chewy (thanks to the red wine) and I often wonder if it would have met with Kenf’s approval. If you like things spicy add a bit of finely chopped fresh chilli. If using fresh octopus clean thoroughly, rinse and drain well. If using frozen octopus thaw, rinse and drain. 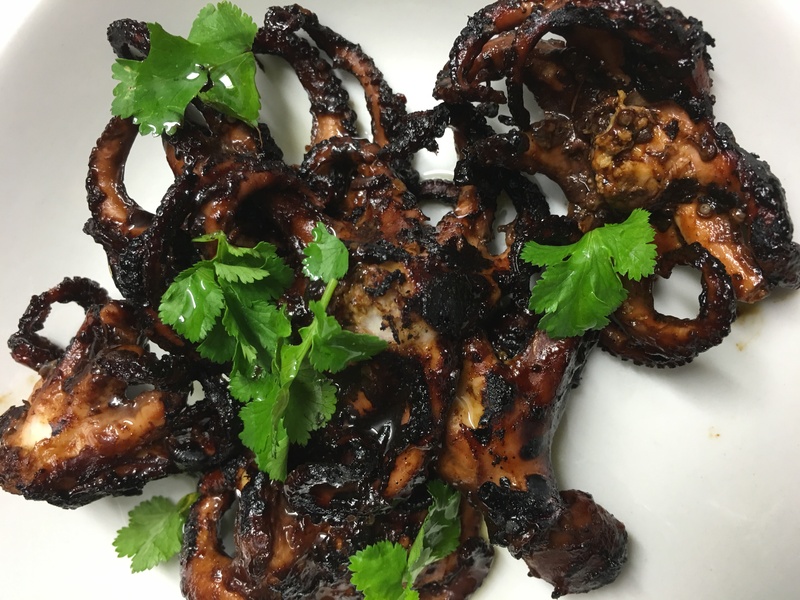 Place balsamic vinegar and wine in a saucepan with the octopus. Bring to the boil then reduce the heat to low and simmer for 20 mins. Drain, discard the wine and place octopus in a bowl with the soy, chilli sauce, tomato sauce and olive oil. Stir to combine. Heat BBQ to high and cook the octopus for 5-6 mins, turning occasionally, until lightly charred and crispy on the edges. Serve on a bed of rocket or with steamed rice, garnished with coriander and a drizzle of oil. Australia’s Oyster Coast farmers operate across eight estuaries from the Shoalhaven River to Wonboyn Lake on the pristine south coast of New South Wales. A group of passionate artisans, they are committed to growing oysters of the highest quality in estuaries so well-managed they can be eaten straight out of the water. Three different species, each with different characteristics influenced by the water in which they live, are being produced. Going from left-to-right in the photo, the Sydney Rock is a native oyster with a firm, creamy texture and incredible flavour. Highly prized by top restaurants, it can only be found along the South Eastern coastline of Australia. Next comes the Angasi, another native oyster which is rarer than its Sydney cousin and recognised by its flat shell and stronger flavour. The Pacific Oyster is significantly bigger than the other two. 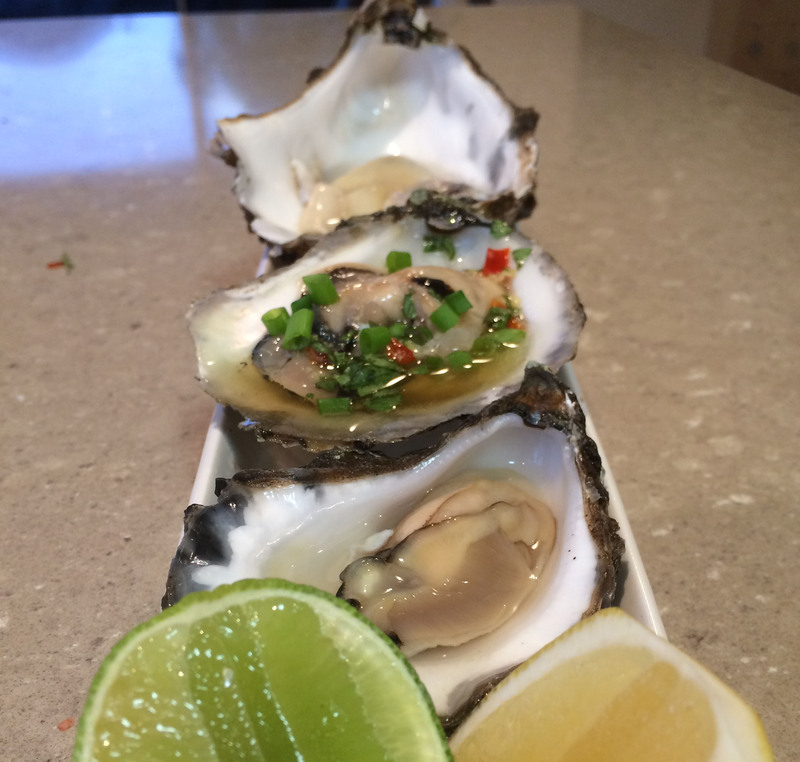 Introduced into Australia from Japan, it’s the mostly widely-consumed oyster in the world. Fast-growing and plump with a clean, salty flavour. They have also started exporting to a number of countries in Asia, including China, Hong Kong and Singapore and plan to expand to other countries in the region in the near future. They are also developing a domestic tourism trail along Australia’s Oyster Coast, with lease tours, restaurants, accommodation, sea planes and kayaks. This is still under development, but will take on greater importance once direct air flights between Canberra and Singapore commence. Each of the three oysters requires a slightly different opening technique. You need a special knife and it’s also a big plus to have a family member who knows what they’re doing. Our son-in-law Sacha is our oyster expert. An Australian of Chilean origin Sacha has eaten more oysters than I’ve had hot dinners and says the only way to eat them is plain, or with a squeeze of lemon juice. For those who like something a bit different I made this simple Asian sauce from Jamie Oliver. Shake in a jar with a lid.